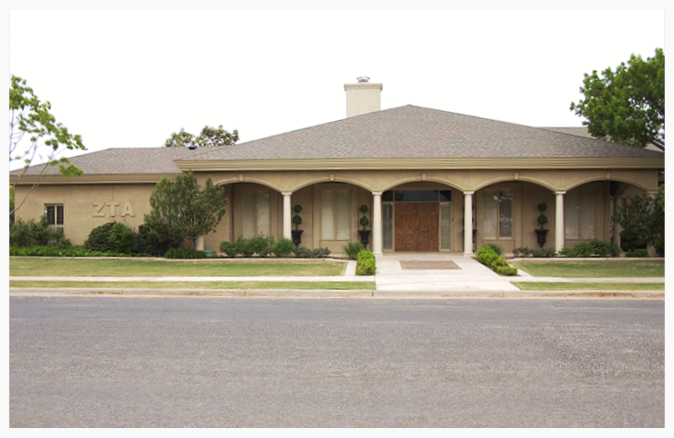 Texas Tech Zeta Tau Alpha was chartered on April 11, 1953 and is the Gamma Tau chapter. Each Zeta chapter is represented by a silver link in our Chain of Chapters. Gamma Tau is the 92nd link. As one of the first NPC groups to build a Lodge on Greek Circle in the 1970s, ZTA Gamma Tau leaders were given the opportunity to randomly draw the lot we would soon call home. #11 was drawn first by ZTA and is located in a prime position on the corner of Quaker Avenue and Greek Circle. A Spanish-style flat roofed structure was built, and lovingly called "Taco Bell" of Greek Circle! In 1998, the local house corporation conducted a fundraising campaign to successfully jumpstart a complete renovation that doubled the size of our Lodge. Both the exterior and interior were completely rebuilt including a high pitched roof and new chapter room that seats 200 members. Additional storage and bathrooms were added. In 2013 we underwent a full kitchen remodel and received new furniture for living room and dining room. This summer in 2016 we're renovating our interior again to have new furniture and walls. Our Lodge remains one of the most utilized facilities on Greek Circle. Besides meetings, study hall & chapter activities, our members enjoy the Lodge as a home away from home!